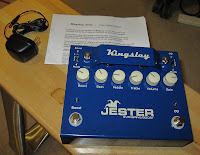 The Kingsley Jester is a dual function pedal designed and personally handwired by Simon Jarrett of Kingsley Amplifiers which sports a clean boost on one side and a full-on overdrive circuit on the other. 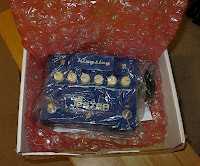 It is driven by two 12AX7 tubes and requires a special power supply in order to operate properly. The construction is top-notch, with a heavy duty metal casing and roadworthy "plunger" footswitches. This thing is built to last for players who actually gig out. On each side of the Jester is a 3 position slider switch that steps up the amount of the effect. On the OD side, the 3 position switch increases the amount of OD with position one being more of a "crunch", position two a full-bodied medium gain and position three a full-on liquidy gain for rich, thick leads. The boost side's 3 position switch alters the boost voicing with position one being warm boost, position two a bright boost and position three a mid boost. The controls are Bass, Mid, Treble and Gain for the OD mode while the boost mode has a single Boost knob for setting the overall boost level. Of course, the two effects can be run simultaneoulsy so that while playing with the OD engaged the boost can then be activated to effectively cut through the mix for solos. The sound of the Jester is quite simply amazing. This has to be the best sounding OD pedal on the market as it truly responds like an amplifier. The tone is "tube-like" and responsive... very warm and harmonically rich. Unlike most analog and digital distortion pedals which almost always sound harsh and overbearing, the Jester sounds like a circuit built into your amp and not at all like a pedal. The circuit is modeled on Simon's Deluxe 30 series amps and the ToneBaron (which I own and absolutely love). "...a hard-wire by-pass circuit that leaves the overdrive input connected, even when by-passing the effect, resulting in quiet switching between the effect and by-pass mode...". I can attest to the fact that the switching is absolutely silent and I cannot tell the pedal is in my chain when it's off. The Jester is definitely not a "tone sucker". I can highly recommend this pedal to anyone looking for great rock tones with warmth and harmonic richness. Giving a little Les Paul Love!! Love the tube drivers too! Best pedal out there. Get's pretty high gain if you want. It costs a fair bit BUT it's a bargain. Look inside. It's a hand wired amp and plays like one. Great pedal.